Dog is centered in front of the handler facing the handler. Start with the dog in left hand heel position. Step forward with the right foot and with the right hand (or target stick) indicate to the dog to move out in front. Move the dog out in a straight line. The dog needs enough room to be able to turn around and approach with a straight spine. Once the dog is out as far as you can reach, lure the dog to turn around and start to approach you. As the dog moves towards you return your right foot next to your left foot. Keep the dog centered and bring him in as close to you as you want. Reward in the correct position. Repeat the above from your left and right hand sides. If training Face-to-front from the left hand side, once the dog is in position in the front and after he has been rewarded, turn right 90 degrees on the spot and repeat. 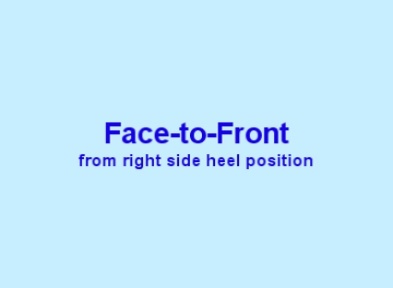 If training Face-to-front from the right hand side, once the dog is in position in the front and after he has been rewarded, turn left 90 degrees on the spot and repeat. These videos illustrate hand and leg movements used to teach the dog Front position.